Join the discussion on our forums! Come discuss King Mosh over in our dedicated King Mosh discussion topic. Probably the best legendary Warrior has ever gotten. this card is sick in hunter if you get it from jeweled mackaw. Great card in control warrior, I play it in my quest warrior, it has clutched several wins for me against quest rogues. Overall great card, only downfalls currently are pirate warrior and quest mage, but dirty rat has won against mages for me and taunts generally wreck pirate warrior. I'm 26-5 with my quest warrior, the deck is similar to SjoW's, but i added in king mosh, whirlwind, and dirty rats. Running Deathwing has some advantages,it doesnt need any damage setup.Just destroys everything.King mosh needs more setup and whirlwind generally.So you have to add an additional card to your deck which is bad i think. same i got a gold version today and i love it but i already have a normal one so i might play a few games with the pretty and then de to craft something fun I don't have. After testing this card, I use my whirlwinds too early in the game for this card to be worth using: Terrible card. What can you do vs aggro if you dying fast by turn 5? Play more early game taunts? done both of those and ghoul does not work with mosh because of high mana cost. I don't understand all the "thumbs down" on your comments. 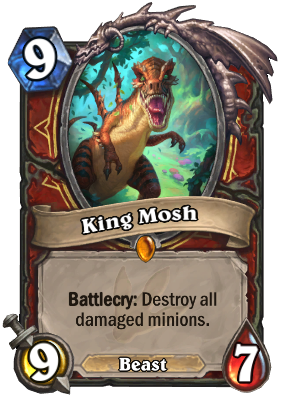 I wouldn't say King Mosh is a terrible card but it's not game-changing either. It requires combo setup with other cards so it's almost always a 10 mana play. Deathwing is a 10 mana play with no setup, no combo, but a bigger potential drawback losing your hand. If you're in a really tough situation and your only out is Deathwing, you'd play it. I think sleep with the fishes deals enough damage most of the time to make King Mosh unnecessary. Ravaging Ghoul + Sleep with the Fishes = 4 damage to all minions. If the board state is worse than that why not just play Brawl? I personally would not run King Mosh over either of those two spells. Whole soundtrack here if you are interested. I feel like i'm going to misplay this by playing king moist and then whirlwind. Lol it will out to WILD. Nice joke.